About Shelf Help and Founder Toni Jones — shelf help. Shelf Help is an online/offline book club and community dedicated to self-help and self-development, founded by journalist Toni Jones. 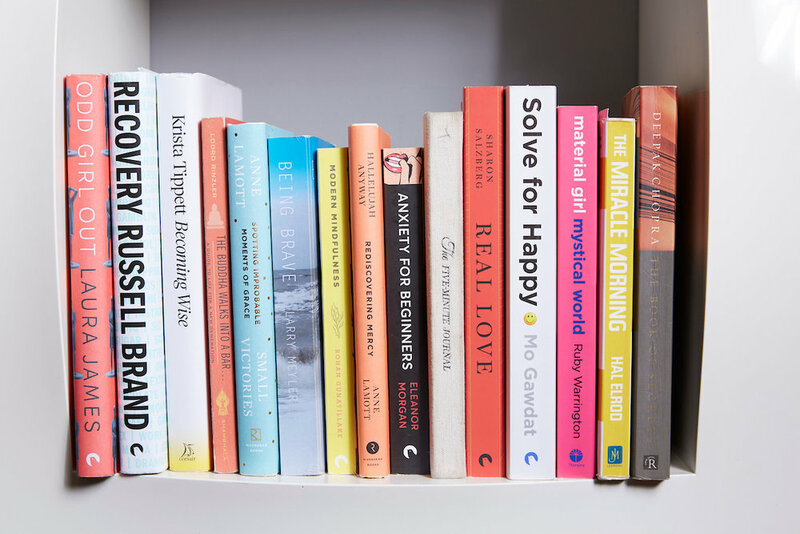 The Shelf Help mission is to connect as many people as possible with books that will inspire them to look at themselves in a different, more positive way. Each month we choose a different self-help title to work through with members, who can join the digital chat on Facebook and Instagram, or one of the real life book clubs, held on the last Monday of each month. (Want to host your own meetup? We’re looking for hosts EVERYWHERE to help share the self-love love. Apply to the join the Shelf Help family HERE). Our aim is to help demystify the self-help sector, celebrate all that's great about it, and prove that working on ourselves doesn't need to be scary or weird. We want to empower our community to help themselves, and each other, through the tools and strategies gleaned from our favourite books and experts. Because we believe that constantly working on ourselves is what we're here to do, in order to each live our best lives and fulfil our purpose here on Planet Earth. And that we can all benefit from a bit of self-reflection and group love, whatever's going on in life right now. Founder Toni Jones is a freelance writer and producer based in west London, where she hosts regular meetups and author events. Toni says: "I spent most of my 20s and 30s working and playing hard as Fashion and Women's editors on some of the world’s most notorious news titles. Until one day I realised that ‘working hard’ wasn’t working for me anymore, and ‘playing hard’ wasn’t actually all that much fun. Maybe it never had been? "I thought I loved living with constant pressure and deadlines and jetlag and hangovers, but had I actually just designed a life that made it easy to bury or numb anything I might have (should have) felt given a bit of space? "My childhood story isn’t totally rosy, but it’s not that much different to many others, I’m sure; a drunk, disinterested dad, a very busy single mum, a huge, complicated family and a load of assumed responsibility at an early age. And with no one to tell me that it was ok to feel sad or confused or angry, or to tell me that I was interesting or important, and no tools to help me process any of the feelings of guilt or shame that come with all of the above I did what most girls with unresolved ‘daddy issues’ and zero self-belief do: ignored it, worked too hard and went to the pub. For, oh, about 25 years. "And so I found self-help at the same time as many thousands before me, at the lowest point in my life. On the outside it was good, there was no obvious trauma or drama to cope with, I was a busy and successful woman with everything going for me. "But inside I was shattered, and lonely, and sometimes really sad, and these feelings were manifesting themselves in careless and increasingly self-destructive behaviour that with hindsight I can see was a big fat cliched cry for help. "I didn't know why I felt like this (now I know better, I do better). But I did know that I was tired of the relentless wheel of 'work hard and play harder' that I had created for myself and I needed to get off. "Leaving my full-time job as an editor was the first step in my 'journey' towards self-awareness and self-love, and it was bloody hard because I had spent over ten years grafting to create a media career in these tough news publications. "My job as a journalist defined me, working for big-name publications validated me, and it definitely kept me way too busy to think about anything that really mattered. Like why I needed external validation anyway. "And you don't have to be Freud to work out that's probably why I chose this career path in the first place. Being too busy to think can seem like an excellent strategy when, left to your own devices, what you think is mostly that you are not important or interesting or ever quite 'enough'. "Abandoning the comfort of a punishing but familiar full-time job to go solo was terrifying. Who was I, with no title, no company, no team, no boss and no pay check to endorse me? Ultimately I knew that I was doing the right thing giving myself time to pause, but rather than enjoying this QT out of the rat race I felt even more lost than before. "Trying to make friends with myself after decades of neglect was tough, and I soon started to struggle with lots of new and unfamiliar feelings, thinking that it would be much easier to abandon project TJ, rebury everything, ignore any glimmers of insight and go back to the Company/the pub/being too busy to care. "And then along came Paul McKenna. An unlikely guru? Possibly. But when the pupil is ready the teacher appears and I was obviously ready for something (anything!) when his book ‘Change Your Life in Seven Days’ fell (jumped?) on the floor in front of me in the local Oxfam. "Self-help isn't an instant fix, and it took me over a year to read that book about changing your life in seven days (ha! ), because the concepts in it - that we are not our thoughts, that we can let go of limiting beliefs, that we can learn self-confidence, that we create our own reality - were so new to me. I'm still working on a couple of them several years later. Before then I'd never spent any time really looking at my behaviour, or focusing on my thoughts or emotions. I didn't think I really had many emotions (lol - I've since discovered I was very wrong about that). "But I didn’t know the answer. What was my dream life? What did the best future version of me look like? How was I planning to get there? No clue! And not knowing the answer led to me to start questioning everything, about myself, my life, my childhood, my choices, and all the experiences that had shaped me into this person who didn't even know what made her happy anymore. "That first journey into self-analysis was uncomfortable, fascinating, painful and enlightening all at the same time. And when I (finally!) finished that Paul McKenna book the self-help seed had been well and truly planted. "Since then I have become a card-carrying member of the self-development tribe, devouring everything from soothing Louise Hay affirmations to mind-blowing Quantum Theory tomes in my quest for a bit more peace and self-awareness. "Self-help has (and does) make me laugh, cry, cringe and often ask WTF?! Yes there is a some pseudo-science and properly naff stuff out there, but there's also so much incredible inspiration, motivation and insight too. "Some of the books I have read in the last few years have fundamentally changed me forever. And once I plucked up the courage to talk to my friends about my experiences I learned that some of them were having similar struggles, realisations and breakthroughs, and it was brilliant to be able to finally share fears and feelings, as well as 'out-there' book recommendations with people who got it and - even better - got me. "I still work too hard, sometimes. And I still play too hard, sometimes. And in between I am working on cultivating some inner peace and quiet and rescuing myself from myself, with the help of some magical books and magical people (shout out to my life-saving therapist, my amazing and kind husband, and my brilliant crew of friends). "And that is the aim of Shelf Help, to be a platform to bring together magical books and magical people (because we're all a bit magic) based on principles of kindness, confidentiality and no judgement, to take the stigma out of self-help, and to create a brilliant, empowering community that can really make a difference to its' members lives. "I still have some messy parts to my life. And no doubt always will. But I think that is what is helping make Shelf Help so authentic, empowering and hopefully successful: I’m not perfect and I don’t expect anyone else to be either. I’m working on myself at the same time everyone reading the books or commenting on the Instagram page is, so we’re building this brilliant support network together. Toni's work has appeared in The Telegraph, The Times, The Daily Mail, MailOnline, You magazine, Women’s Health, Forbes.com, The Evening Standard, Grazia, InStyle, Stella, BBC, The Huffington Post, The New York Post, The Hollywood Reporter and Billboard Magazine.